"With the recent announcement by Apple to use DisplayPort and not HDMI on MacBook laptops, how can I connect one of these new Macs to an HDMI port on my HDTV?" Like many quirks in connecting external displays to an laptop, it's all about having the right adapter. I find it frustrating Apple didn't include an HDMI port on the new MacBook line, but the solution for connecting your HDTV via the DisplayPort is only a $13 adapter away. A number of online retailers offer DisplayPort to HDMI adapters, although so far I haven't seen them in any real world retail stores. In the short term, it may be tricky to track down the MacBook variation of this, which requires a Mini DisplayPort. Keep your eye on my favorite place to shop for this type of thing — Monoprice.com, which offers highly competitive prices on products I consistently find reliable. They currently offer full sized DisplayPort adapters for connecting to HDMI. Once available, a Mini DisplayPort to HDMI adapter will connect to your DisplayPort on the side of your MacBook, then you use a normal HDMI cable to connect from the adapter to your HDTV. 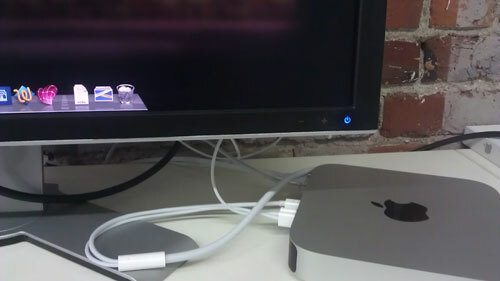 DisplayPort is a VESA standard and handles both audio and video over the same cable, similar to the way HDMI works. This connection should support both audio and video from your MacBook, the same way HDMI would, although I haven't been able to verify that MacBook DisplayPort connections support audio.